What, exactly, is “Discover Rowing”? 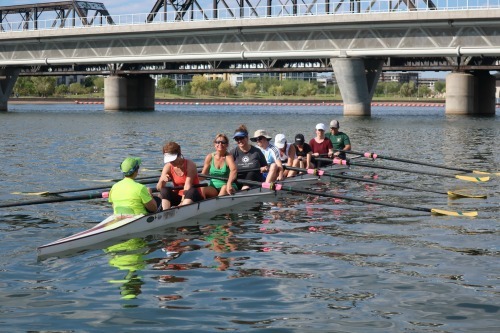 It is exactly what it sounds like: a program to introduce new rowers to the sport of rowing. We want to help you “discover” the same love for the sport that we all share! Discover Rowing is designed for adults who have never experienced rowing on the water. We realize some of you exercisers out there may have rowed on a machine, the “erg”, but we can safely say that rowing on the water is a completely different (better!) experience. You will be in a small group of people who, like you, have no idea what they’re doing, so you’ll all be in the same boat! Discover Rowing is a three-part program, each session of which introduces a different aspect of the sport, and is designed to provide you with a very basic understanding of rowing. The three-part sessions are offered in one week, on a Tuesday and Thursday evening, (usually 6 pm), and Saturday morning (usually 8 am). Quick and ...easy?! Discover Rowing is for adults of all ages and fitness levels, though we do recommend you have some basic fitness level, and/or have been exercising regularly, before beginning rowing. Discover Rowing is a prerequisite to joining our next level of rowing program, “Learn-to-Row”. Discover Rowing is a ton of fun, and after taking it, you will want to learn more!